Every year between the 17th July and the 24th August, the Earth passes through a trail of debris left by the orbit of the comet Swift-Tuttle. The comet was discovered in 1862 but records of the Perseids date back to 36AD. As the Earth passes through the debris, the dust is drawn to the Earth’s atmosphere. A tiny speak of dust can burn spectacularly in the night sky. As many as 60 – 100 meteors per hour can be seen in a clear sky in the countryside. Travelling at around 37 miles per second the meteors heat up to somewhere in the region of 3000 degrees Fahrenheit and either vaporise or explode. As a result of this, the August sky in the Northern Hemisphere is filled with glorious streaks of light – shooting stars. If you have a wish to make, now might be a good time to catch a falling star! The shower itself is called The Perseids because the meteors appear to radiate from the constellation of Perseus. Perseus was the Greek hero who killed the snake-headed Medusa and then saved Andromeda from the clutches of a sea monster. Medusa was once a beautiful maiden. Seduced (or raped in some accounts) by the sea-God Poseidon, jealous Athena turned her into a terrifying Gorgon. No man could look upon her face without being turned to stone in terror. Perseus (aided by the Gods) destroyed Medusa by using his shield to see her reflection and cutting off her head. Until he gave it to Athena, Perseus used the Medusa head as a weapon, turning Atlas into the mountain range and killing his enemies. 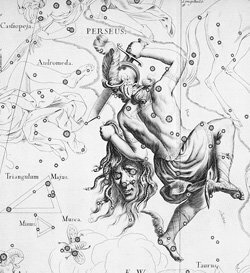 Within the constellation of Perseus is the ‘demon-star’ Algol. This blinking star is seen as the eye of Medusa. These days it is known that the star blinks because it is a binary star. The blinking is caused by the smaller star moving in front of the larger from our viewpoint on earth. Despite what we know astronomically, astrologically the malefic energy of this star is still cited. In modern times however we have learned to see how the energy of this star can make us aware of ‘horror’ rather than simply being a black and white ‘point of doom’ in the chart. That said it is wise to be aware when Algol is active in the chart. The yearly appearance of the Perseids remind us that we must not be blinded by our fears. Neither however can we ignore the horrors that occur in the world. As the Perseids meteors seem to dance along the blade of Perseus’ sword, we are shown that sometimes it is necessary to confront our fears for they can become our greatest strengths. You will find Perseus in the north-east of the sky. I recommend a visit to the countryside, away from the glow of city lights. However, most years I have spotted the odd child of Perseus even living close to the city centre. The best time to catch the shower tends to be between the 11th – 13th August each year between 1 a.m. and dawn. Hi – I enjoyed this post. Bob A over at http://blackholesandastrostuff.blogspot.com has some great pictures of the meteor shower along with an aurora. I thought of him as I was reading this, and it occured to me that you might enjoy looking at the video clip he made.